Somatic embryogenesis was induced from stamen filaments and an embryogenic suspension culture was established in the grapevine cultivar Mencía using thidiazuron and 2,4-dichlorophenoxyacetic acid. Four combinations of each growth regulator were assessed for somatic embryo induction in a basal medium containing Nitsch and Nitsch salts and Murashige and Skoog vitamins, and an embryogenic suspension was established in liquid medium containing 1 μM 2,4-dichlorophenoxyacetic acid plus 4.5 μM thidiazuron. By using thidiazuron instead of benzyladenine, induction rates were improved over those previously reported for this cultivar and were relatively high compared with previous results in other cultivars. Three combinations of indole-3-acetic acid and benzyladenine and two inoculum levels were tested in a differentiation medium containing activated charcoal. The size of the inoculum affected the developmental stage of the somatic embryos, whereas the type of growth regulator did not. Both the germination and plant conversion rates were high (87.8% and 88.2%, respectively). An analysis of plant ploidy levels by flow cytometry revealed that 5.6% of the somatic embryo-derived plants were tetraploid. The mean nuclear DNA content of the diploid somatic embryo-derived plants was, on average, 6.7% lower than that of diploid field-grown plants, indicating that this protocol produces low levels of somaclonal variation. The results obtained here indicate that such variations in grapevine can occur both through changes in the ploidy level and by loss of genetic material during somatic embryogenesis. This research was funded by the Spanish Ministry of Economy and Competitivity (grant AGL2009-07488). 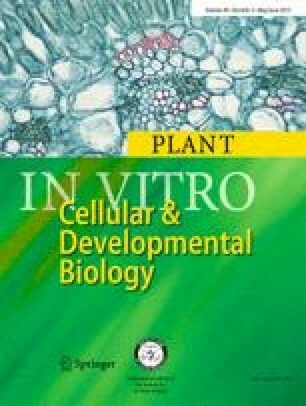 This report is a contribution of the Interuniversity Research Group in Biotechnology and Reproductive Biology of Woody Plant (group code 08IDI1705). Yosvanis Acanda thanks the Spanish Ministry of Foreign Affairs and Cooperation for its support through a MAEC-AECID scholarship. The authors thank Dr. Joao Loureiro (University of Aveiro, Portugal) for providing the S. lycopersicum cv. Stupicke seeds and María José Graña and Julián Benéitez for their invaluable help during plant material collection at the Centro de Formación y Experimentación de Viticultura y Enología de Ribadumia (Pontevedra, Spain), a viticultural facility owned by the regional government of Galicia.